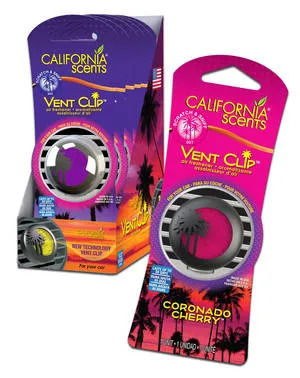 California Scents offers an array of air fresheners. Products are sold in car washes, car dealers, automotive stores, convenience stores, and mass merchandisers. Product offerings include Spillproof Organic Air Freshener®, California Car Scents®, Xtreme®, Cool Gel®, Citrus Splash®, and Orange Squeeze® Sprays, and Vent Clips. What’s New/Best Seller • The New Vent Clip. Advantages/Features • Featuring 90 percent solid fragrance oil, the new Vent Clip is capable of delivering miles of freshness for up to 30 days, without the worry of spills. Beautifully designed to compliment any automotive interior, the clip attaches neatly to the air vent and effectively circulates a fresh scent every time the A/C, vent, or heater is on. Available in five popular fragrances in peggable eye-catching packaging or a matching 6-unit tray. For over 100 years, Meguiar’s has produced specialized state-of-the-art formulations for making every car show car perfect. Meguiar’s provides high performance products for every automotive surface. What’s New/Best Seller • Ultimate Black Tire Coating. Advantages/Features • The Ultimate Black Tire Coating provides a long-lasting coating that dries with a deep, black, wet look that will not sling. The product lasts over a month and creates a water and wear resistant coating that will not peel or crack as it ages. Application is easy — simply spray onto a clean and dry tire and you’re done. The product can withstand rain and harsh weather leaving tires with a rich, black, protective shine. Impeltronics is a supplier of quality, professional, high-lumen LED flashlights. The lights are engineered and designed utilizing superior materials providing a high level of endurance capable of functioning under extreme conditions. What’s New/Best Seller • LED Extendable Magnetic Flashlight. Advantages/Features • The LED Magnetic Flashlight Tool allows the user to find and retrieve objects in hard to reach areas. Magnets in both the head and tail end of the flashlight permit the recovery of magnetic objects. 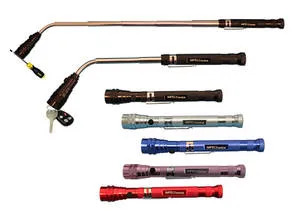 The light features: three bright LED lights for increased visibility; extendable from a compact 6.75” to over 21” long for better reach; flexible LED head for 360° directional rotation; magnetic head for retrieving metal objects; magnetic tail for retrieving up to 8-lb metal objects; and pocket or belt clip. Handpresso has coupled espresso quality to mobility, making it possible to drink espresso wherever. What’s New/Best Seller • Handpresso Auto. Advantages/Features • Handpresso Auto operates while placed in a car’s cup holder. The espresso machine is powered by the car’s cigarette lighter, simply add water and an espresso pod. After two and a half minutes, the espresso is ready. Car-Freshner Corporation is the global leader in automotive air fresheners. CarFreshner meets consumer demand for freshness by offering a number of air care products across several brands, including Little Trees, Perk, and Money House Blessing. All Little Trees and Perk products are made in the United States. What’s New/Best Seller • Perk Vent Wrap®. Advantages/Features • The unique, patentpending design makes it virtually invisible. It grips the vent blades and won’t block the air flow, leaving the vent free to be used as intended and the air “invisibly fresh.” Hidden under the soft black protective cover is StediScent®, a revolutionary fragrance technology that regulates the fragrance delivery. Vent Wrap is available in a range of Perk fragrances, and each one is individually sealed, holding in the fragrance until it is ready to be released. A four pack provides up to 60 days of fabulous fragrance. 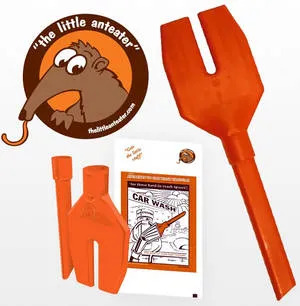 Advantages/Features • The Little Anteater is a re-useable crevice tool that fits into the standard vacuum nozzle found at car wash vacuum islands. The simple to use device allows the user to get into the small spaces of a car’s interior in much the same way as the crevice attachment that comes with home vacuums. The consumer inserts the product into the nozzle, vacuums the interior’s small spaces, removes and takes the product home with them. The two-piece device stores in the glove box or center console easily. The tip of the anteater is separate from the body and was designed to be rotated 360 degrees without dislodging the tip or any reduction in suction. The product is vending machine compatible.